Packers head coach Mike McCarthy normally is one of the league’s more aggressive head coaches, but he went conservative in crucial moments in Sunday’s loss. A significant portion of the Packers’ misfortunes on Sunday can be attributed to poor coaching decisions. Two in particular may not have changed the outcome of the game, but they’re emblematic of the sort of processes that got the Packers into trouble. First, at the end of the first half the Packers made a little drive to get down the field and were nominally in field goal range… but not really. The Packers trotted out for a 61-yard field goal to end the half. 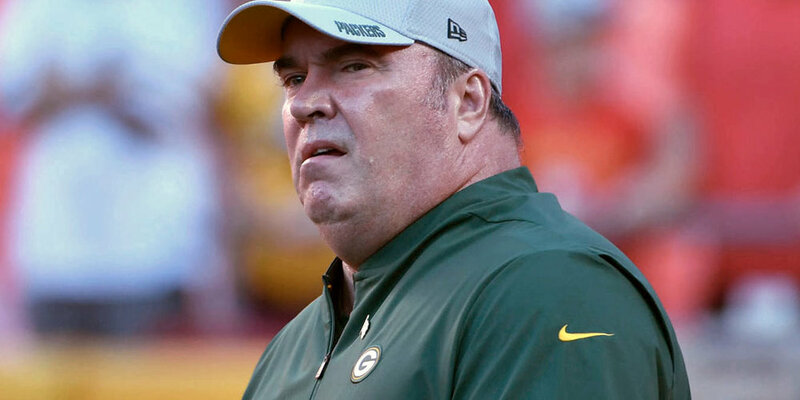 What are you thinking, Mike McCarthy? The decision reminded me of the Pittsburgh game in 2017 when McCarthy sent Mason Crosby out for a 57-yard field goal despite it being a well-known fact that it’s incredibly tough to kick field goals in Pittsburgh. Almost nobody ever makes field goals of 50 yards or more in Pittsburgh, but McCarthy tried anyway. The best case scenario for the 60-yard attempt pretty much played out, saving the Packers from a potentially terrible outcome like a returned missed kick. A botched hold led to JK Scott tossing a pass toward Mason Crosby, which is in itself a terrible, terrible game situation. But even assuming the hold is okay, what are the odds of Crosby making a 60-something in the rain with the wind doing who knows what? I don’t understand the thinking there. The longest field goal I could ever find in FedEx Field was a 59-yard field goal by Graham Gano – who was known for having a strong leg – in 2011. It just seemed like there was a very, very low percentage chance for success there. The second questionable play came late in the game on 4th and 5. It’s 4th quarter with 7:35 left and the Packers are on their own 46. They’re trailing by 11. McCarthy decides to punt. You absolutely have to go for it there. You have to. You must go for it. Look at what happened next and you’ll understand why. The Packers got the ball back almost as quickly as you possibly could. The Redskins went three-and-out on their next possession and even stopped the clock with an incomplete pass on third down. But by the time the Packers got the ball back, there was just 5:55 left. Even though they got the ball back to their own 46-yard line almost immediately (only to have Randall Cobb fumble it away), they still had to score twice. Only now they had less than six minutes to do it. If you’re going to punt on 4th and 5 down by 11, you might as well just quit right then. The Packers never had a better shot at points for the remainder of the game. What’s worse is McCarthy is typically one of the more aggressive coaches in the league when it comes to going for it on fourth down. But in this situation he went conservative. Why? It didn’t make any sense, especially just a week prior he threw into the end zone twice with under two minutes left and a lead. Those decisions may not have cost the Packers the game, but they took away chances for the to make up ground.